Researchers knew that neonicotinoids could hurt bees, but they're still learning exactly how. This new study shows some of that damage is behavioral. In recent years, environmental groups proposed banning neonicotinoids — an insecticide sprayed on almost all of the U.S.'s corn and cotton — because they can kill off bee populations. Now, we're getting a better understanding of why these chemicals are so dangerous. New research shows how they hurt individual pollinators and, in turn, whole colonies. Researchers took multiple colonies of bees and exposed some to a common type of neonicotinoid. Then they moved the bees to a specially-designed robotic platform that tracks how worker bees move and behave, to see if their activity changed. They discovered worker bees who were more exposed to the insecticide became less active over time, and less likely to feed and take care of larva. They were also more likely to be found around the edges of the nest, rather than close by the queen bee. Overall, these chemicals made it harder for colonies to regulate their temperature, which can stifle larva development. 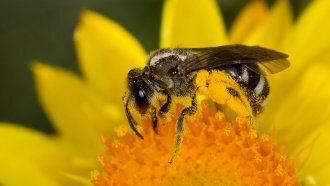 This adds to the growing body of research connecting neonicotinoids to declines in bee populations. Previous studies found they can lower the life expectancy and reproductive success of worker bees. If queens are exposed, it can weaken their immune systems — which threatens the entire colony. All this pesticide research is starting to affect agriculture policies, at least in some places. In the EU, neonicotinoids were banned for outdoor agriculture use in April of 2018 — but the U.S. Environmental Protection Agency is expected to re-approve the pesticides by the end of the same year.